I found this dog/cat on the streets. I took it home, I think he's a missing pet. What do I do? Do I bring it to PAWS? 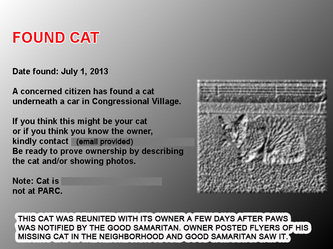 Good Samaritans who decide take home the dog/cat they find can send us a photo of the animal. We will put up the announcement with a black & white photo on our social media accounts but we are sorry that we cannot take the animal into the shelter. PAWS is a limited admission shelter that is exclusive to rescued animals in distress (in imminent danger of losing life or limb) where cases are filed against the animal offenders. We do not take in lost pets. 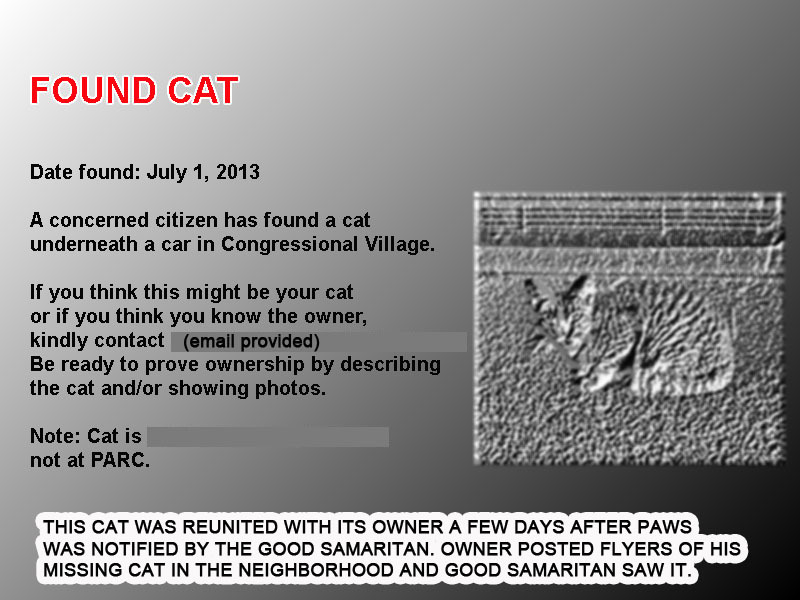 Lost dogs/cats are usually brought to the pound so the owners could look for them there. We understand why some good Samaritans may not want to resort to this as the unclaimed animals are put down after a few days. Good Samaritans are encouraged to hold on to the dog/cat or if they can't keep it, have someone they trust temporarily take care of the animal while the owner is given a chance to contact you. To protect the animal from opportunistic people or breeders who just want to score a free pet and claim they are the owners -- we deliberately make FOUND Announcements in black and white, dotted and we omit particular details of the animal (ie, if animal is a purebreed, male or female, we do not indicate this). 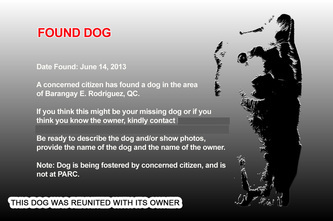 Those who find lost dogs are advised to do the same in their independent efforts to find the owner. One can inform the barangay of the found pet in case the owner searches for his dog/cat there. One can also take the animal to a vet clinic and ask them to scan the dog/cat for a microchip - if the animal has a microchip, owner information will be available. One should also screen those who claim to be owners, ask for full description (including identifying marks, and if any, description of collar, dog tags), ask for proof of ownership (their photos with or of the dog/cat from their old album on Facebook, a post of plea to help look for missing dog/cat, and if applicable, a microchip certificate). Limit entertaining inquiries to phone or online and not disclose exact location of where the animal is temporarily housed- this is also for your security. 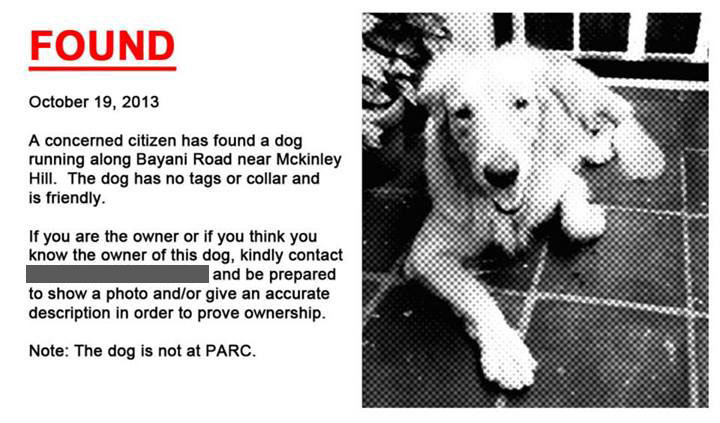 In addition, we hope the owner sees and responds to the PAWS announcement. If the animal isn't in any way injured or showing signs of neglect, then chances are it simply got lost and the owners should be looking for it. They should be willing to cover your expenses for the dog/cat's upkeep while under your care should you have an issue with cost.